NEW Whitehill Welfare boss Ian Little reckons his track record of developing young players could prove vital in their battle to avoid relegation from the Lowland League. Little, who was appointed as the Midlothian club’s third manager of a dismal season to date just more than a week ago, feels he has inherited a talented group of players who have still to fulfil their potential. However, the former Berwick Rangers, Vale of Leithen and Livingston under-20s head coach recognises the scale of the task he faces in order to lift the Rosewell outfit away from the drop zone. A run of fixtures against three of the top four teams in the table won’t make life any easier but Little, who turns 46 on Monday, has never shirked a challenge and wants his players to start believing in themselves more. Commenting on their tough run of matches, Little said: “I want to instil a bit of belief and a winning mentality in the players. It doesn’t matter who we’re playing, the bigger the better for me. When I played, you always got a bigger buzz from playing against the top teams and I’m trying to get the players to understand that should always be the case. 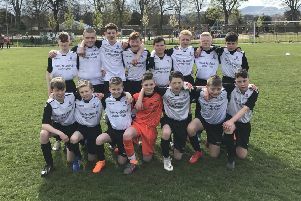 “Games against teams round about you in the table become even more important as this stage of the season, but if we can build on what we did for 90 minutes against Kelty in the Football Nation Cup last Saturday then we’ll improve. “The boys certainly worked hard and seemed to enjoy themselves, so it was a small step in the right direction. I was more concerned about what we could do with the ball when he had it rather than focus too much on the attacking side of things. “It’s about getting my ideas across as quickly as possible now. I like my teams to get the ball down and play, but have I got enough time to do that? Little took his place in the dugout for the first-time at New Central Park, following a recent spell on the coaching team at East of Scotland side Bonnyrigg Rose. And he is aiming to integrate as many of the Welfare’s under-20 prospects to his first-team squad with the help of coach Grant Sandison. Little added: “I’d been out the game for a while, but I’ve been desperate to get back involved at a decent level. I’ve been at a few clubs as an assistant and just felt it was time to take on a new challenge after missing out on a couple of jobs in the SPFL. “I feel I’ve worked up to a level where I wanted to become my own boss again. You’ve always got to eye up certain clubs and Whitehill is a well-established club. It’s a good set-up, despite them being in a poor league position. The main priority is to get as many points on the board and try to keep this club in the league. Elsewhere in Lowland League action this weekend, ninth-placed Vale of Leithen are the visitors to Ainslie Park where Spartans will seek to build on back-to-back victories as they play their second Friday night fixture in a row. Edinburgh University, desperate to banish memories of a 5-0 defeat by BSC Glasgow last weekend, welcome second-bottom Dalbeattie Star to East Peffermill, while Civil Service Strollers make the journey to face Gretna 2008 at Raydale Park.